Sonicu provides superior operational visibility and uniform implementation across all departments and locations with one cost-effective solution. From a single vaccine refrigerator to an entire hospital campus, Sonicu’s cloud-based platform provides a monitoring solution for every healthcare application - cold storage temperature from vaccines to cryogenic; ambient room conditions, including humidity and differential air pressure; sound monitoring; air velocity and custom applications. 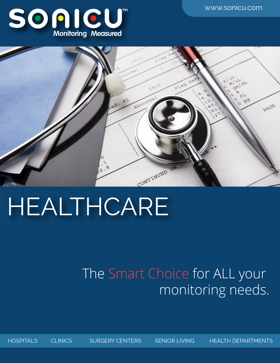 Download our free Healthcare brochure to discover how one wireless, cloud-based monitoring platform improves safety, streamlines regulatory compliance and saves time and money for your enterprise.